If (like us) you love a bit of seasonally inspired decorating, you may have begun thinking about how you can change things up for Easter, or if you don't celebrate Easter, for springtime more generally. From standout centrepieces inspired by spring that are sure to get you feeling creative to sweet, but subtle hints at Easter, you're sure to find something that suits your taste with our stylish Easter decorating ideas. For more easy ways to transform your home, take a look at our weekend projects and craft inspiration hub pages. If you're feeling creative and are looking to keep costs to a minimum when it comes to Easter decorating ideas, consider looking to nature for inspiration. With greenery picked up from the garden or (on the ground of) a nearby park, and supplemented with a few bits and bobs from the local florist (or supermarket), this spring-inspired centrepiece could be put together for a fraction of the price of buying something pre-made. Hung from the ceiling, it makes a striking focal point above a table decorated for dinner on Easter Sunday. Alternatively, if you're looking for something a little more low-key, consider incorporating Easter-inspired shades into your table setting. We can't get enough of pastels, which are both reminiscent of spring and right on-trend. Perfect for Easter table decorating ideas, as well as the rest of the year, you can find these gorgeous Fusion Pasta Bowls at John Lewis & Partners. If you're looking for an alternative to Easter eggs, consider giving the gift of fresh flowers – potted or otherwise – this Easter. Dressed in a reusable fabric bag and tied together with ribbon, plants not only make perfect Easter decorating ideas and gorgeous gifts, but are often a much more sustainable alternative to plastic wrapped chocolate eggs, too. Okay, so we've already mentioned pastels, but when it comes to decorating for Easter, it really doesn't get much better than these soft, muted shades. Teamed with tasselled bunting – an easy, temporary Easter decorating idea that we just can't get enough of – you've got everything you need for Easter. Reimagining items you already own is one of the easiest ways to decorate for the changing seasons, and this year we've fallen in love with the idea of creating an adorable Easter decorating idea for a table setting made from an old napkin. Simply tie your napkin – the more pastel toned the better – with a ribbon about one fifth of the way up and you've got yourself a pair of Easter-inspired rabbit ears. Easy (and cute). Perhaps a slightly more subtle approach to Easter decorating ideas, we love this way of displaying spring-inspired ceramics. Whether as the centrepiece of a table or coffee table, this is an easy way to hint at the new season without having to go all out. The beauty of ceramics? They can be used year after year – and year-round. Find these Blue and White Ceramic Hen Decorations at The Contemporary Home. Then, shop more Spring inspired ceramics from Very's range. If you're feeling completely overwhelmed by adoration for the spring months, you might consider going all out with an Easter-inspired mural. The beauty of murals is that they're as easy to put up as they are to take down, so opting for one up isn't the commitment you might have initially assumed. Be inspired by our other mural design ideas. Another slightly more subtle approach to decorating for Easter is opting to switch up your lighting. Placing copper wired fairy lights inside a glass bell jar or Mason jar is a Pinterest-worthy trend that's effective in warming up a space; opt for Easter-inspired lighting and you've got yourself some subtly seasonal decoration. If you like this idea, you'll love the rest of our Mason jar DIY ideas. Find these Easter Micro Battery Fairy Lights at Lights 4 Fun. Then, shop more of their tiny, twinkly fairy lights for the rest of the year. If you're looking to create a feature wall that's even more temporary than a mural, consider making your own paper flower wall. Though we'll admit that making each flower from scratch may be a little time consuming for the average Joe, we know the crafters among us live for projects like this. Find more craft inspiration on our hub page. For those of us who are slightly less creatively inclined, recreate the look using Decadent Decs Blush Flower Pom Poms from Talking Tables. Another easy and inexpensive way to create Easter decorating ideas is by baking in the kitchen. Using these Meri Meri Easter Cookie Cutters from John Lewis & Partners makes it easier than ever to transform your bakes into something Easter-inspired. Not a fan of cookies? There's always the classic cornflake cakes that seem to make a reappearance, adorned with chocolate eggs, annually. Perfect for a laid back Easter breakfast, we love the country feel of this handmade pottery from Susie Watson Designs. 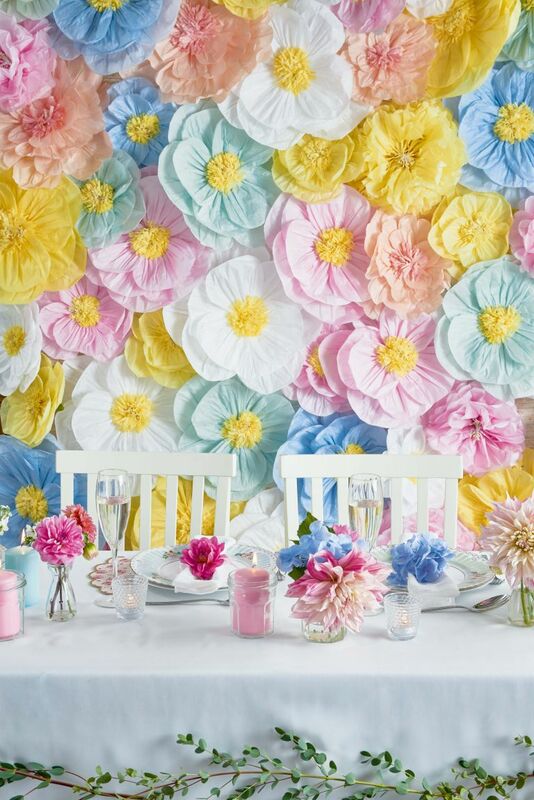 Pastel shades and sweet motifs make it the perfect addition to the table in the spring, or all year around. We love this pretty Easter wreath. It's really easy to make and is perfect for adorning your front door or Easter dining table. And we think it's pretty enough to decorate your home year round, too. Follow our step by step guide to find out how to make an Easter wreath to create one for your home. Looking for more crafts to take on this Easter weekend?